Fog, rain, snow, sleet, and dust can make a commute extremely hazardous. Fortunately, fog lights increase a driver’s visibility so that they can make it through their commute safely. Read along to learn more about LED fog lights and discover five amazing fog lights that can enhance your vehicle. 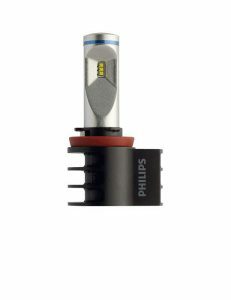 The Philips X-treme LED fog light offers 12 volts of power and 840 lumens of intensely bright white illumination. The cool white color pairs well with stock Xenon LED headlights. What’s more, these lights are a viable direct replacement for H8, H11, and H16 fog lights fitments. The lights even have a patented SafeBeam technology that directs their light beams toward the road rather than fellow drivers’ eyes. Beyond that, the light has an astounding 12-year life expectancy and is backed by a generous 3-year warranty. We’re big fans of Philips LED’s sleek design. The light has a solid fitment that works in a wide range of vehicle makes and models. What’s more, the LED’s reflector panel helps direct light straight ahead while seemingly lengthening the beam. These lights are also extremely easy to install. Not to mention, they do not trigger any error codes upon installation. The color temperature of the lights is also pleasantly cool, offering a stark improvement over most stock fog lights. If you’re looking for a light that will help you see all the obstacles ahead of you, the Philips LED fog light is a solid choice. The X-tremeVision’s light triggers a reading close to 6,000 kelvins. 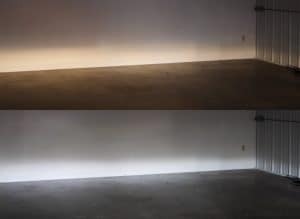 In fact, these lights have a color temperature as cool as ice. However, the Philips LED’s durable design is what protects it from actually overheating. Each light has a rear heat sink to protect the fog lamp housing from melting during extended use. If anything should go wrong, the company is very good about honoring its extended 3-year warranty. With that said, very few customers have reported degradation issues with the X-tremeVision lights. 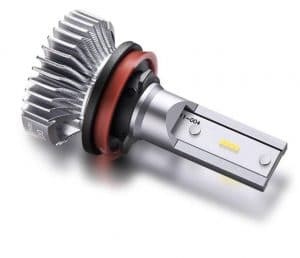 The JDM Astar LED fog light boasts 5 watts of powerful white light that will cut through the thickest fog. The lights are sold in sets with 3,200 combined lumens or 1,600 lumens per bulb. The output is a powerful Xenon white beam that is 2.5 inches long and 1.47 inches in diameter. It suitable to replace 9040, 9140, 9145, 9050, 9155, and H10 bulbs. 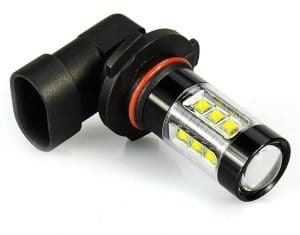 If you’re looking for an extremely bright light to replace your weak stock bulbs, the Astars are an excellent option. They produce cool white beams that can shine through dense haze. While some drivers complained that the Astars shined directly into the face of oncoming drivers, we experienced nothing of the sort. With that said, we did find that the lights were somewhat difficult to install. The trick to installing them involves rotating them 180 degrees to match up the chips. Keep in mind that this takes a bit of trial and error without any clear markers to point the way. While we prefer the Astars as fog lights, they can also function as rear brake lights. 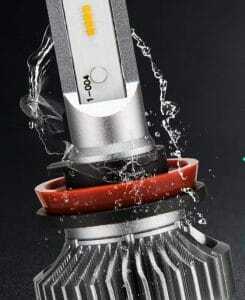 In fact, they are engineered to automatically brighten when the brake is depressed. With that said, keep in mind that they may send up some error codes upon installation. You may even need to install a resistor to get them working properly. We recommend contacting Astar for rewiring tips, as the effort is well worth the bright visibility boosting results. 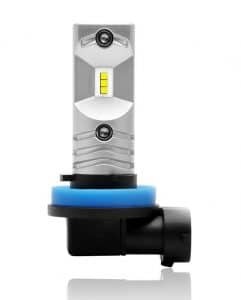 The Beamtech LED fog light set offers 800 lumens of bright Xenon white light. Each bulb utilizes approximately 30 watts of power, making these extremely energy efficient. What’s more, these lights feature cold-pressed aluminum heat sinks that reduce temperatures by 35 percent. With that said, the bulbs boast easy a user-friendly plug-and-play design. The Beamtech’s 1-year warranty gives consumers the peace of mind they need to give these amazing lights a try. Not only that, but the Beamtech encourages their customers to reach out to them with question and concerns. Of course, Beamtech’s aptly angled halogen bulb offers unquestionably bright and reliable illumination. What’s more, it features heat protection to ensure that the light lives up to its promised longevity of around 10,000 hours of runtime. While the polarity of most LED dog lights can make them tricky to install, the Beamtechs can be inserted in either direction. If you’re someone who doesn’t want to spend extra time fumbling around the front end of your vehicle, these lights are a great option. The Marsauto LED fog lights feature ultra-thin 3.5-millimeter light tubes that provide 360 degrees of bright white illumination. Not only that, but this fog light is engineered to prevent glare from being directed toward oncoming traffic. 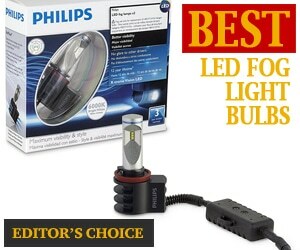 What’s more, these bulbs are compatible with H11, H8, and H16. On top of that, they have no polarity. As such, they can be inserted on either side. The Marsauto lights offer optimal visibility to drivers traversing difficult roadways. Their color ranges from 5,000 to 6,500 kelvins, making for a cool white light that is similar to daylight. What’s more, these lights last for up to 10,000 hours. Whether you’re looking to get through fog, rain, snow, or dust, the Marsauto LED lights have your back. Many customers have expressed satisfaction when using the Marsautos to replace their vehicle’s stock fog lights. The consensus is that the lights are super easy to install, with the entire process taking less than 5 minutes. What’s more, their bright white color seems to match most stock headlights perfectly. Not to mention, they are rather affordable. The Sealight LED fog lights offer 4,000 lumens of dramatic roadway illumination. The lights are made of premium-quality LED chips that offer 360 degrees of light. What’s more, the lights have a grade-A aluminum shell that enables superior heat dissipation. 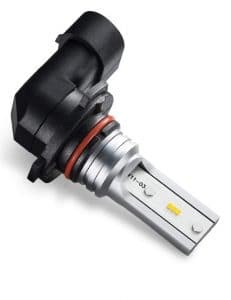 The lights also utilize 12 volts of power and are compatible with H11, H8, and H16 fitments. Customers found that the compact Sealight LEDs were easy to install. In fact, they have a simple plug-and-play design. Once they are installed, the Sealights work great as both running and fog lights. They even come with a 1-year hassle-free warranty to put consumers’ worries at ease. It’s important to note that the Sealights have a sensitive polarity. Therefore, if the light is not inserted in the correct direction, it will not light up. If this is the case, you will need to rotate the light 180 degrees in order to correct the installation. The lights are CAN (controller area network) bus-ready, meaning they are programmed to work with CAN bus-equipped computer systems. Shopping for fog lights can be confusing. After all, the product descriptions are often riddled with confusing technical terms and measurements. Read along to learn about what to consider when purchasing a set of fog lights for your vehicle. Many vehicles have preinstalled stock fog lights, while others require aftermarket attachments. Keep in mind that some vehicles will need a new bumper to accommodate fog lights, while others have predetermined areas designed to be fitted with fog lights. On top of that, some manufacturers sell fog lights with universal mounts. Before you select and install a set of fog lights, you need to ensure that it is compatible with your vehicle. If you’re looking to replace your factory-installed OEM (original equipment manufacturer) fog lights, check to make sure your prospective options are designed to fit the existing opening. The main function of fog lights is to illuminate the roadway in acclimate weather. As such, the lights need to be significantly bright. The brightness of a set of fog lights is determined by the amount of power (watts) and visible light (lumens) that are produced. Vehicles typically use from 20 to 60 watts for a set of fog lights. This translates to roughly 800 to 2,000 lumens. Light patterns and beam distances tend to vary greatly between different fog light bulbs. You’ll want to find a far-reaching, focused beam of light. Fog lights should expand horizontally but have a relatively narrow verticle reach. An abrupt cutoff is imperative to ensure that the lights are not going to blind oncoming drivers nor reflect onto airborne moisture and dust. Consumers prefer a wide range of color temperatures depending on their perceived brightness and aesthetic preference. 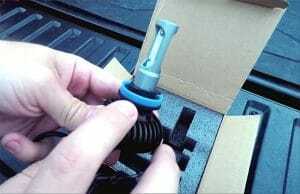 Many consumers also look to match their aftermarket retrofits with their preexisting stock lights. Fog lights range from yellow to cool white. These color temperatures are measured in kelvins. Yellow lights are around 3,000 kelvins, while cool white lights are around 6,000 kelvins. With that said, higher measurements of kelvins translate to cooler colors. Since fog lights are often utilized in acclimate weather, it’s particularly important that they are sealed against moisture and grit. Since LED lights also produce heat, they are often equipped with heat dissipating features. Keep in mind that LED lights that are well fortified can last as long as 10,000 hours. 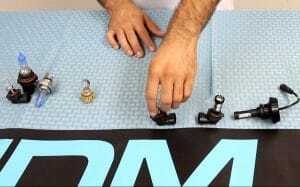 Installing aftermarket fog lights should not be difficult. Look for lights that feature plug-and-play designs. These usually can be inserted, rotated, and clicked into place with ease. Installation tends to vary from one vehicle to another. Keep in mind that fog lights are installed close to the ground, as they are intended to illuminate below the beam of your regular headlights. It’s not enough to simply install your fog lights. In fact, you have to adjust the beam to ensure that it is not directed too high. Upward-pointing fog lights are a common hazard that can end up blinding oncoming traffic. Pro Tip: Ensure that your fog lights are mounted roughly 1 to 2 feet above the ground. Once you’ve done this, find a flat area that is exactly 25 feet away from a 90-degree wall. Park your car with your headlights facing the wall. Measure the distance from the center of the light beam to the ground. After this, use the adjustment screw on the fog lights to drop the center of the beam about 4 inches lower. For the most part, installing new fog lights in your vehicle is a relatively easy task. Many manufacturers have developed simple plug-and-play designs. Always follow the manufacturer’s instructions when installing a replacement light. 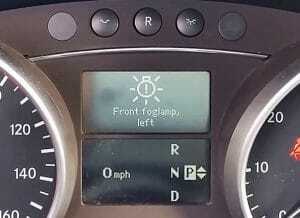 Keep in mind that some LED fog lights will throw error codes. This is often because they use a low amount of power when compared to stock fog lights. Consider the fact that you may need to install custom resistors or use a decoder to remedy any error codes. On the other hand, some cars come pre-equipped with CAN bus bulbs. You can continue to purchase CAN bus bulbs, which have built-in resistors, in order to avoid throwing error codes upon installation. Keep in mind that rapid blinking is a common issue that stems from using bulbs that are incompatible with CAN bus systems. In recent years, LEDs having swelled in popularity. Their predominance as a lighting solution is due to their impressive longevity, durability, and efficiency. LED lights can last as long as 10,000 hours. 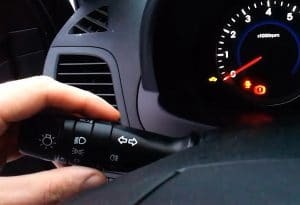 Considering the limited application of fog lights, they often outlast the life of the vehicle in which they are installed. LEDs are also much bright than halogen alternatives. Not to mention, they come in much cooler white colors. It’s worth noting that LED lights are often more expensive than halogen lights. With that said, they often save customers money in the long run. However, they can be more difficult to install. Nevertheless, many vehicle owners have made the switch. LED lights have the potential to outshine HID fog lights. The LED’s cool white color projects well off the surface of the roadway. The crisp white beam of the LED can be seen as extremely focused and brilliant both on and off the ground. Such notable improvements make LED fog lights an obvious choice for individuals looking for improved roadway visibility. 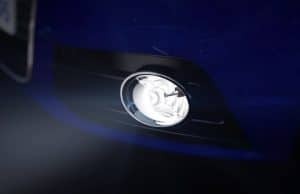 If you’re new to the world of vehicle lighting, you’re probably wondering why so many drivers are focused on their vehicle’s fog lights. Fog lights should only be used in heavy fog, rain, snow, and dust. Fog lights should only be used as needed. If they are not directed properly, they can visually impair oncoming traffic. Take the time to aim your fog lights, ensuring that they are directed downward and close to the ground. Keep in mind that the light should cutoff below the bumper of oncoming vehicles. Proper alignment doesn’t only benefit other drivers. When light is reflected directly at airborne particles, it bounces back. 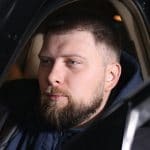 Whereas, light that is distributed on the ground will improve your visibility of the roadway while reducing the amount of light that bounces back. For years, stock fog lights were manufactured to produce a yellow beam. This is because manufacturers thought that yellow lights had greater wavelengths. While this is not accurate, yellow and warm white lights reduce the amount of eye strain caused by light that is reflected back onto the driver. With that said, cool white lights are currently all the rage. In fact, most consumers prefer lights with color temperatures at or above 6,000 kelvins. Fog lights cut through poor visibility conditions, such as thick fog, swirling snow, and windblown dust. What’s more, they dramatically improve the look and feel of a car. When choosing a set of fog lights for your vehicle, always make sure that they are durable, bright, and longlasting. What’s more, doublecheck to ensure that they fit your vehicle, they can be easily adjusted, and they won’t throw any error codes. A solid set of fog lights creates undeniable improvements in roadway visibility. Whether you’re logging thousands of miles a week or just making short daily commutes, LEDs are the way to go.